Nikon F, the start of something big. With production starting in 1959 and running till 1973, the Nikon F was a camera that redirected photography. The Nikon F started a shift that weakened the German rangefinder grip on the industry and shifted the power to Japanese SLR cameras. The Nikon F was not the first SLR but it was the first one to capture the attention of the professional photographers. The F seems to have been the perfect storm of great innovation in SLR technology, fantastic lens and a system approach. 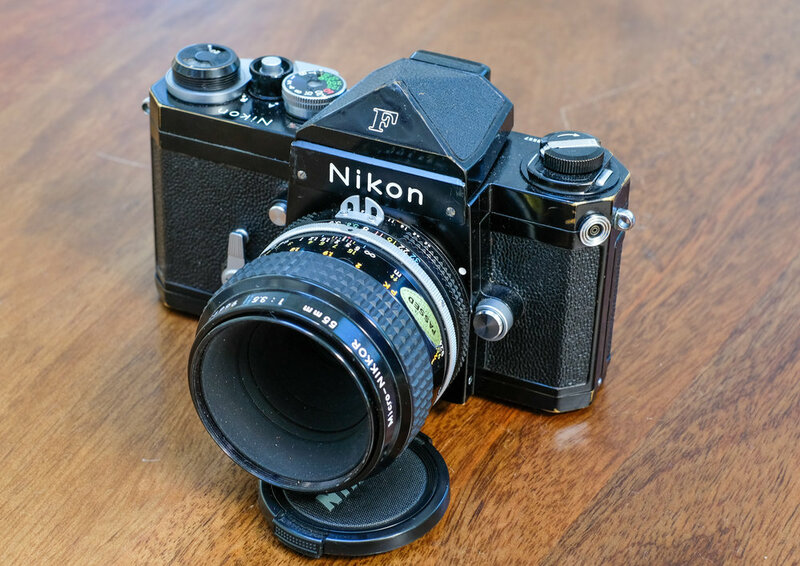 The base of the F was built on the proven Nikon SP rangefinder body. The use of a modular approach allowed for interchangeable backs, focusing screens, motors and lens that utilize the F-mount bayonet lens that remains a standard. This ability to build the system you want was embraced by both professional and amateur shooters. Notable users were war correspondences and news corespondents. There was even a back that held 250 exposures and was used with a motor drive to cover things like NASA launches. This is a camera with more legacy that most. I found my F hiding in the back of a cabinet at a camera store in NYC. It looks like it was well used. There is a dent on the top of the view prism but everything seem to still work fine. This thing real is tough. Shooting the F was great fun. My viewfinder is non-metered and there is no auto anything. Just a smooth SLR with a bright clear view. I used the Micro-NIKKOR 55mm f3.5 lens to capture close details at a car show. The lens offers a minimum focus distance of 9.5 inches. This is a camera that you can make what you want of it. It is not the lightest chunk of camera you will ever use, nor does it have the newest technology. What it does have is more history than about any other camera I have ever have shot. The Nikon F is not the most advanced camera but the link to photography history makes it a camera worth the effort.